For the occasional cleaning job around the home, a reliable pressure washer—especially one that comes complete with a variety of adaptive nozzles and attachments—comes in quite handy and will make cleaning much easier and faster to complete. While the Greenworks Power Washer may not make the list of our top electric power washers, it comes in close as a reliable washer for a very reasonable price. For superficial tasks around the house, the easy-to-use washer and convenient hose reel is well-suited for those hard-to-reach areas. 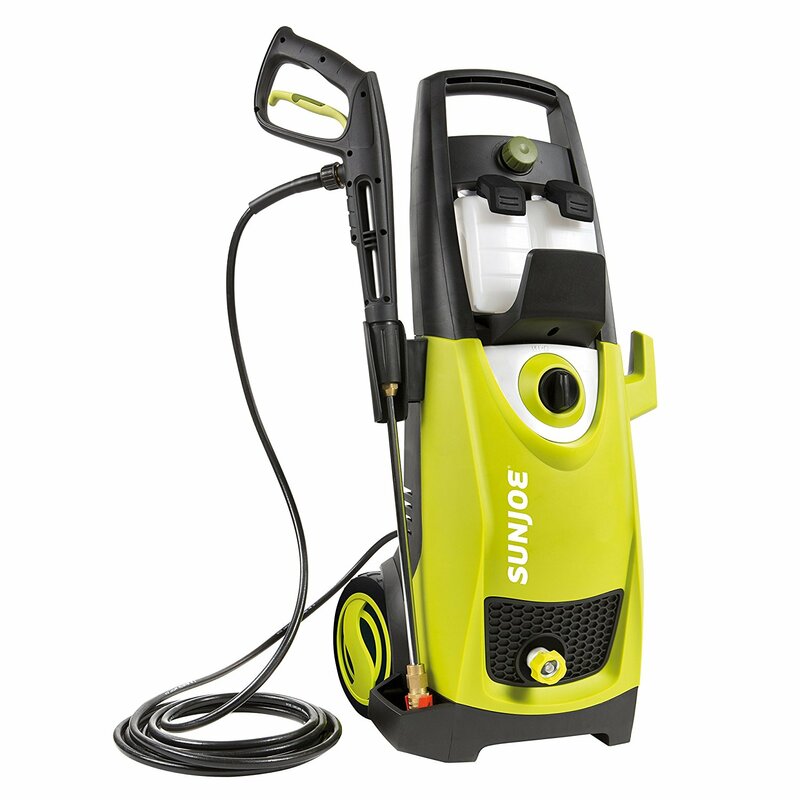 It’s one of the few decent electric pressure washers under $100 (if you can spend the extra money, look at the Sun Joe) but Greenworks’ customer service is top notch, and will resolve any issues– no questions asked. 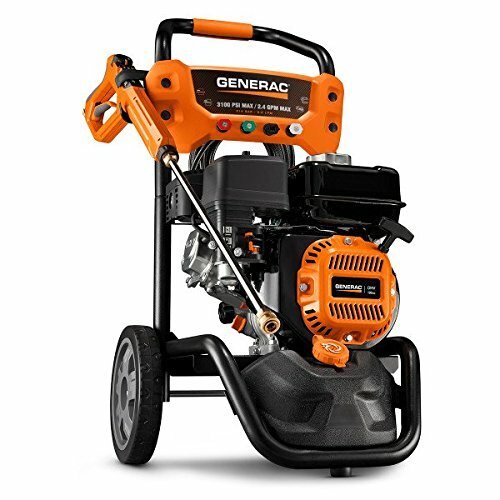 Consistently delivering up to 1.2 gallons per minute, the 1700 PSI, 13 amp waterproof motor is on the lower end of pressure washer PSI power, but is well-suited for handling lighter applications including cleaning dirty windows, decks, vehicles, and many other areas around the home. If you’re looking for a little more oomph, and want to stick to the Greenworks Pressure Washer family, look at the 1950 PSI model. The washer comes with a handy soap applicator for cleaning a variety of surfaces, making this a great choice for washing a car using a pressure washer! It includes 3 nozzles– 0 degree, 25 degree and 40 degree– all made to easily accommodate various angles. One of our favorite features is the handy storage area for the spray gun, nozzle, and wand, and it’s nice to know that there are additional accessories available for purchase. The floor cleaning attachment, for example, easily cleans tiles and grout for your floors quickly and easily. Your neighbors will love how quiet this unit is, and you will love how clean this runs. Lightweight at only 22 pounds and a 35 foot convenient power cord with inline GFCI for exterior outlets, this unit is able to transport easily into extended areas. And unlike other gas-powered models, this Greenworks pressure washer has no noxious fumes that pose harmful threats to your health. You will never need to buy gas and oil, which will save you money in the long run. As a member of PWMA (Pressure Washers Association Certified), Greenworks complies to the stringent standard for pressure washers that are made expressly for household, consumer, commercial or farm use. PMWA is controlled by a third party to ensure the proper verification of maximum pressure and water flow are adhered to, meaning you’re assured to get that full 1700 PSI. 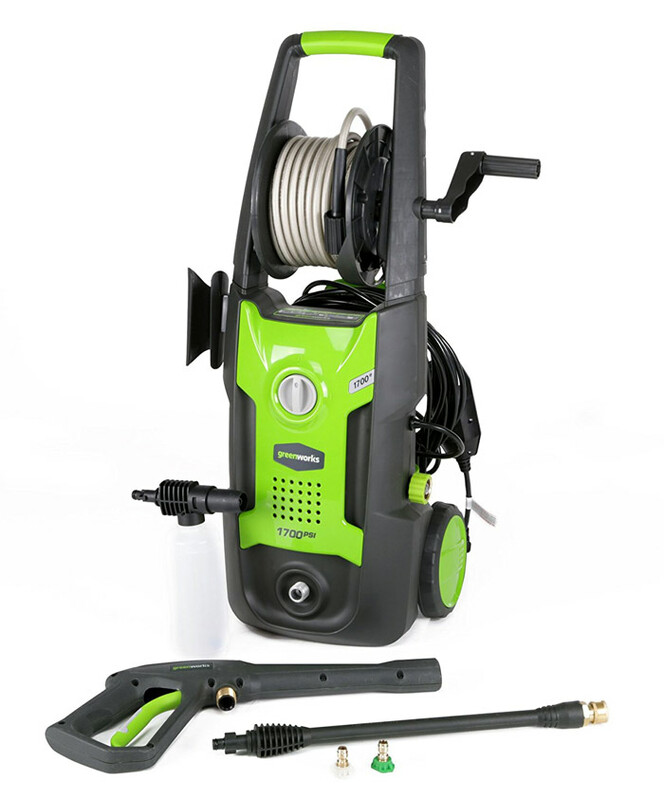 Why didn’t it make our top pressure washer list? Well, there are some concerns about plastic connections that would most likely be metal (and therefore more reliable) in higher-quality power washers. But for under $100, you get what you pay for. The hose reel (a nice feature in our eyes) can also sometimes be cumbersome to wind up, but the alternative is a hose that’s unruly and scattered on the floor. You can rest assured that if anything does go wrong with your product, the biggest selling point of the Greenworks pressure washer is the customer service. It’s backed by a one-year warranty, and from what we’ve seen, Greenworks is diligent about making sure you are 100% satisfied with the outcome of your issue, whether it would be full replacement or just friendly assistance to resolve the problem. 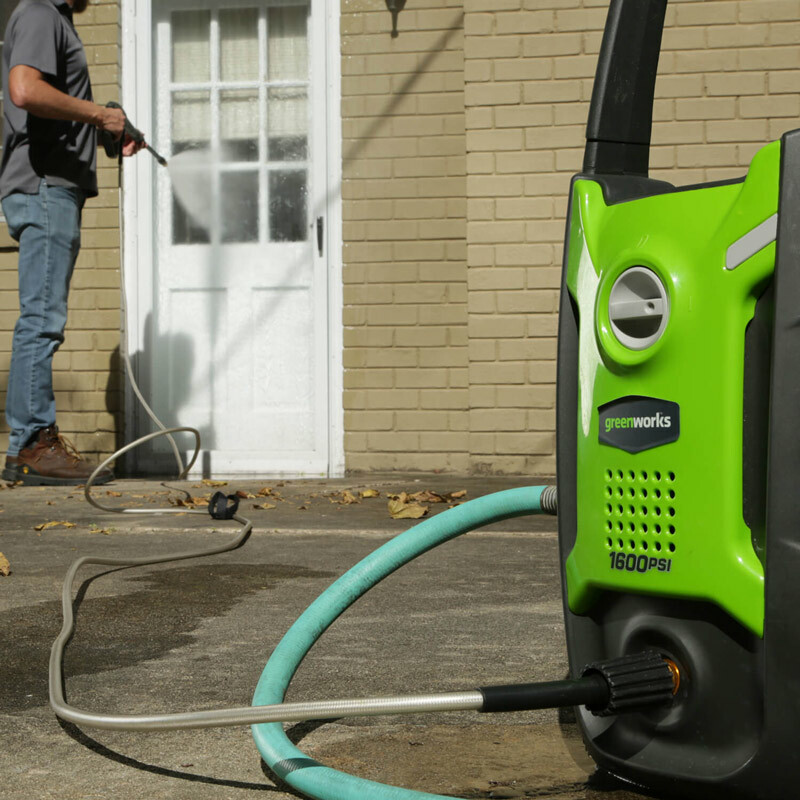 If you’re truly on a budget and looking for a pressure washer for light-duty work around the house, the Greenworks pressure washer is a solid choice. It may not last forever, but the customer service and warranty make up for it. However, if you can spare a little more cash, other electric models like the Karcher or Sun Joe have more cleaning power, meaning a job will take less time– and therefore less wear/tear on the motor and pump.